Wrong uniform, same devastated walk back to the dugout. The Pirates make a bad Cinderella.......they hate sweeping. Resop'd in the 8th on a Chris Young 2 Run Homer. 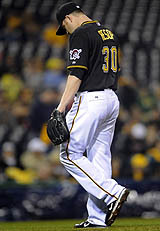 Wasted a great outing by Karstens: 7.0 IP, 4 Hits, 1 BB , 2 SO. Morton vs. Gee tomorrow as the Mets roll into town for a 4 game set. Check for Rich's preview tomorrow.